Tag line: "This ain't no walk in the woods"
The St. Francisville Experiment is a 2000 film that follows a team of four investigators into a supposedly haunted plantation estate in St. Francisville, Louisanna. Hoping to uncover evidence of the paranormal, the four: a filmmaker (Tim Baldini), a psychic (Madison Charap), the team leader (Paul James Palmer) and a history student (Ryan Larson), are each given a camcorder and a variety of high-tech gadgets, all in the hopes of capturing an authentic otherworldly event. The apprehension they feel upon entering the centuries-old estate is soon replaced by abject fear when their 'experiment' proves more successful than any of them dared imagine. 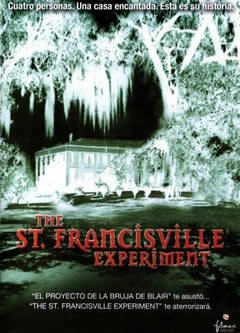 The St. Francisville Experiment is a found-footage horror film in the vein of the wildly popular 1999 indie sensation, The Blair Witch Project. The movie begins as if it were a straight-forward documentary, with a number of talking heads relating the bizarre history of the central location, and warning of the dangers involved with undertaking such an experiment. Not much changes when the movie shifts to St. Francisville, where we witness some pretty tame scares right out of the box (the first involving a chandelier that short-circuits and comes crashing to the ground). There's a lot of talk about 'cold spots' in the house (supposedly a sign that there are spirits around), and even a pretty pathetic “cat-screeching” scene, where the frightened animal comes jumping out of a cupboard. Based on these initial sequences, I was admittedly concerned as to whether The St. Francisville Experiment would deliver on it's promise of scares (the psychic, Madison, even says at one point that the ghosts won't do anything when the video cameras are on...a real problem when your primary task is to document proof of the paranormal). But the tension gets underway when the four make a trip into the attic, where enough happens to convince them to hold a séance. The real thrills, however, take place when the group finally splits up in an attempt to 'cleanse' the house of it's evil nature, a cleansing that goes none too well for any of them. I admit to generally liking the "found-footage" style of horror film: even knowing it's all fake doesn't make it any less interesting for me. I actually find myself wanting to believe it's real. Of course, the movie has to meet me halfway by generating its share of scary moments, and despite getting off to a slow start, The St. Francisville Experiment managed to do just that. When does the new podcast start Doctor and who is involved? I'm afraid I have no information on the new podcast, and am not sure who will be involved. Your best bet is to continue checking the other hosts' blogs for updates. Simone: Thanks for the comment, and we're glad you enjoyed the show. We appreciate your support! I do know that several of the Horror Jungle hosts are putting together another podcast, though I don't have any specific information on it (such as when it will launch). Please be sure to continue checking the other hosts' blogs for updates!